Auro Electronics (India) Pvt. 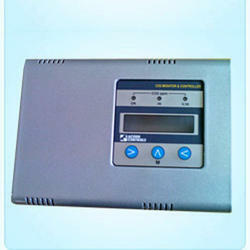 Ltd.
- NDIR method principal for CO2 ( Carbon dioxide ) measurement, available for long term operation. - High repeatability and high accuracy. - Two probes, one is for CO2/Temp. measurement, the other probe is for Humidity/Temp./Dew point measurement. - Separate probe, easy operation and convenient for remote measurement. 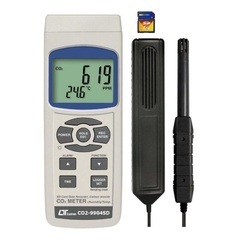 We are the Leading Supplier of Carbon Dioxide Meter. Portable CO2 Meter Model pSENSE is a low cost flexible and easy to use hand-held, instrument designed to measure the carbon dioxide concentration and temperature in surrounding air. The large illuminated display presents the 2 values simultaneously. Built-in data output (RS232) makes it simple to log data for longer time. Wired probe, hold-min-max functions, adjustable automatic shut-off, adjustable backlight. IP54 ABS housing. Supplied with calibration certificate and transport case.